Some customers’ reaction to social media. Public domain image courtesy of Wikimedia Commons. 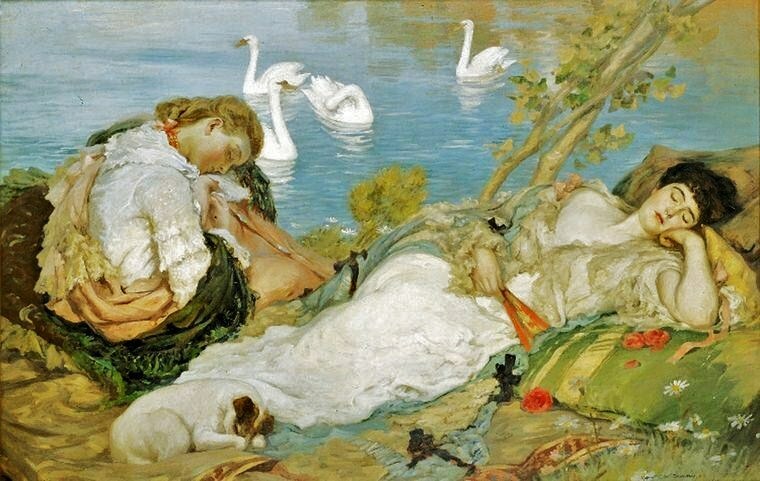 Artist: Rupert Bunny, 1904. Despite all the advice that’s out there about what to do and what NOT to do in social media, it boggles my mind that some people are STILL messing it up. Most people are aware by now that posting revealing info about their jobs, denigrating others or talking on social media when they’re supposed to be at home sick gets them the frowny face from their bosses (or worse), but it still happens and I shake my head when I hear about it in the news. But what’s even scarier is that I see mistakes happening on the social media of businesses, too. For them, it’s even more important not to make errors since social media represents their brand and differentiates them from others in the marketplace. 3. Give fans and followers a reason to stay interested, other than job postings and holiday greetings. Add in some cool stuff now and then to give people something they’ll enjoy seeing. Raytheon’s Twitter account is a great example — they post interesting stuff about the work they do and how it will make life better for people. Party City’s Facebook is also a site I admire — it’s creative, interesting and colorful. Plus, they engage their customers by asking their customers’ opinions or to send fun Instagram images. 5. Stay in touch with what’s happening in the news. Two words: Aurora dress. Ouch. FAIL! 6. If you ever do make a mistake, fix it. Fast. Adding a sprinkle of humor as you admit your goof-up doesn’t hurt. 7. Make sure your social media site’s open to the public. Why block some potential customers from seeing it? They get cranky when that happens. 8. When you post is as important as what you post. If your post is intended for international audiences, not just a local or national audience, it’s a good idea to take time zones into consideration. 9. Your social media is much more than just another way to get your marketing message out to the public. One of the best pieces of advice I ever got was to split your social media 80/20; 20% of it can be about products or services you’re selling; the rest of it should add value to your intended audience. 10. Lighten up your YouTube videos. Some business videos I’ve seen on YouTube feature one speaker talking…and talking…and talking. No change of perspective, no reaction shots from the audience, no diagrams, nothing. (*nods off during video and crashes to floor*) These videos could be SO much better with a little creative editing. And here endeth my mini-lecture. Thank you and good night. Side note: If anyone wants the correct dimensions for images, etc. for social media sites, the nice folks at Luna Metrics have put together a useful infographic for your reference.